Without President George W. Bush, there’d be no President Donald Trump. Our previous Republican president fails to own up to his responsibility for our current one. 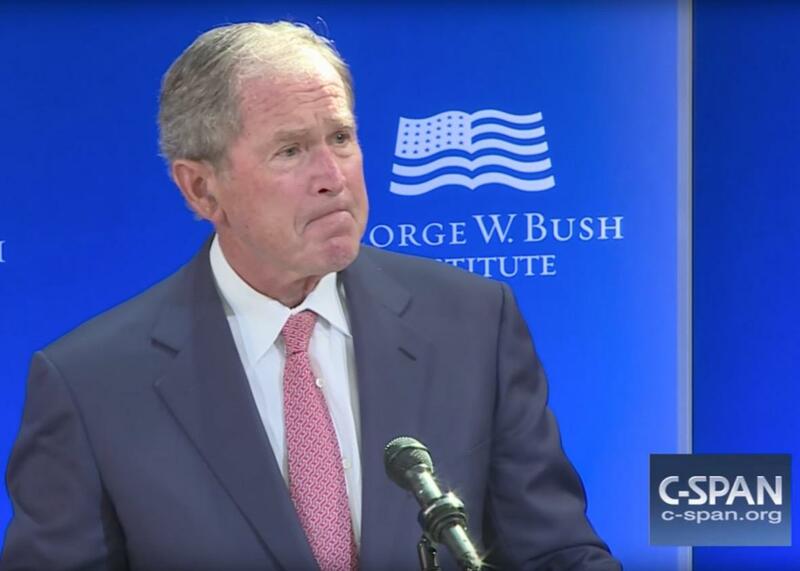 Former President George W. Bush speaks on Thursday in New York. It’s long been an open secret that George W. Bush has little regard for Donald Trump. It’s hard to blame our previous Republican president for that stance, as our current Republican president hasn’t exactly covered himself in glory over the course of his brief political career. Nevertheless, after Bush gave an address in New York City that’s been widely interpreted as a rebuke to Trump’s distinctive brand of nationalism, I was left with a bad taste in my mouth, for the simple reason that had there been no Bush, there’d be no Trump. I realize this must sound like an oversimplification. But as I consider the many ways the Bush presidency has shaped and constrained all that’s come since, I find it hard to conclude otherwise. What I found extraordinary, however, was that in a speech littered with references to Russia and China and to the ongoing challenges facing European democracies, Bush never saw fit to utter the word Iraq. In fairness to the former president, we haven’t been hearing much about Iraq from any of our politicians these days, as there have been other crises, in Syria and North Korea among other places, that have been commanding our attention. It just so happens that Iraq is a tinderbox, where sectarian violence is escalating anew. A number of informed observers, such as the military analyst Emile Simpson, warn that if Iraq does indeed come apart, the chaos that would ensue would dwarf what we’ve seen over the course of the Syrian civil war. One would think Bush would have had a lot to say about the sorry state of Iraq and how his decisions might have contributed to it. Alas, he chose to elide such questions. Bush can’t be blamed for the failures of the Obama and Trump administrations to help Iraq achieve a more durable political settlement. But surely he can acknowledge that some of the backlash against the global engagement both he and I support stems from the fact that his war of choice in Iraq proved a discrediting disaster—so much so that when Trump falsely claimed to have opposed the invasion of Iraq from the start, it was enough to supercharge his bid for the GOP presidential nomination in 2016. Lest we forget, most of Trump’s rivals were paralyzed by the sense that they had to defend the legacy of President Bush’s war, if only in the vaguest, most mealy-mouthed terms. Trump was under no such obligation. Indeed, he presented himself as a cold-eyed realist who’d only invade a country to plunder its resources, a bizarre homage to the old anti-war mantra that Bush’s invasion of Iraq was less a war for democracy than a war for oil. On immigration, Bush placed himself squarely on the side of the angels: “We’ve seen nationalism distorted into nativism—forgotten the dynamism that immigration has always brought to America.” Again, the former president didn’t quite tell the entire story. In deference to the demands of employers, the Bush White House didn’t just seek an amnesty for unauthorized immigrants or an expansion of green cards that would grant their bearers the sense of security they’d need to build new lives in the United States. Rather, Bush and his allies insisted on creating a series of new guest-worker programs aimed at low-wage workers, who’d have limited rights and limited access to safety-net programs. Opposition to Bush’s comprehensive immigration reform proposal came from restrictionists on the political right. Yet it also came from some on the left, including several members of the Congressional Black Caucus, who feared Bush’s guest-worker program would create a class of laborers who’d be vulnerable to exploitation. I have no doubt that the former president feels strongly about “the dynamism that immigration has always brought to America.” But surely he can appreciate that not everyone sees guest-worker programs in such romantic terms. To many Americans, it looks as though the dynamism that low-wage immigrant workers with scant labor protections bring to America chiefly benefits people like George W. Bush. And then there was the former president’s paean to free trade: “We see a fading confidence in the value of free markets and international trade—forgetting that conflict, instability, and poverty follow in the wake of protectionism.” Here too the president ignores the possibility that his own decisions played a major role in souring voters on free trade. Brad Setser, a senior fellow at the Council of Foreign Relations and a former Obama administration official, has argued that had the Bush administration been willing to use the “special safeguards” provision that was part of China’s entry into the World Trade Organization, the U.S. manufacturing sector might have been in a much better position to adapt to Chinese import competition. Instead, the Bush White House stood by as the Chinese engaged in large-scale currency intervention, which in turn made the so-called China shock—the job losses that followed from Chinese import surges—far more severe than it would have been had the U.S. sent a clear signal that it would counter such manipulation. The former president had nothing to say about his role in the devastation of the Rust Belt. Instead, he treated the backlash against free trade as if it were some kind of mania, entirely disconnected from the fact that over the course of his presidency, the U.S. manufacturing sector hemorrhaged jobs, even as productivity outside of the computer and electronics industry was mostly stagnant. Needless to say, many voters who lived through the collapse of manufacturing employment backed Barack Obama in 2008 and 2012, and a small number of them then decided to vote for Trump, despite their misgivings about the man. I like George W. Bush. I really do. He strikes me as a decent, good-hearted person. Yet his refusal to face up to his own responsibility for the state we’re in is, to my mind, essential to understanding why so many Republican rank-and-file voters are at war with their party’s delusional elites.